Katy, TX is a small, friendly community with a rich history. Take a walk through the streets of Katy and you’ll find historical markers everywhere, telling the story of historical homes and downtown buildings, as well as the trademark MKT Railroad Depot, now preserved as the Railroad Park. Today, Katy is known for its charm, friendly residents, close proximity to Houston, and of course, that lovely sunny weather. In fact, the weather is so picturesque here in Katy that many residents add on room additions like sunrooms and enclosed porches in order to bring a bit of the outdoors into their indoor space. Katy prides itself on its natural beauty, and many residents love the view of their lawns or backyard space. 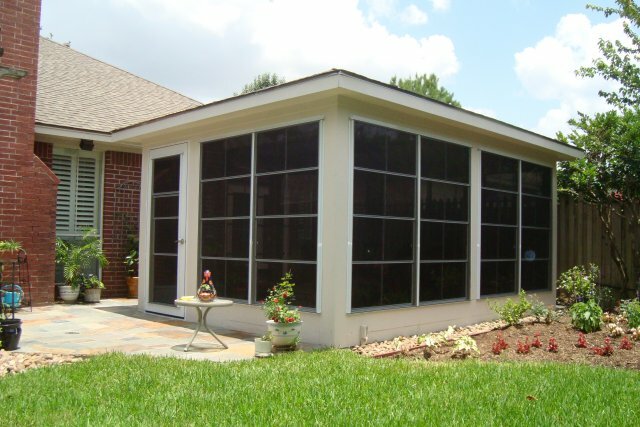 A sunroom addition can be a great way to enjoy those natural outdoor views of Katy while staying inside. You can sip your coffee in the morning, taking in the view, or set up a home office or game room. You can even bring a little nature into your home by using your sunroom as a gorgeous indoor garden, letting your plants soak up all that natural sunlight that Katy, TX provides. Of course, porches are a popular choice in Katy, but what about when the summer is over? It’s true that in Texas, the warmer weather sticks around for longer than much of the rest of the year, but eventually we do have winter, as well as rain storms and such. That’s why some homeowners choose to invest in an enclosed porch, so that no matter what the weather might be outside, they can still enjoy their porch. An enclosed porch doesn’t have to be a fixed screen, however. Many of the enclosed porches we install in Katy have adjustable windows to let in the fresh air on a nice day, while protecting the porch on rainy or cold days.